Editor’s Note: Today’s guest post is by Kelsey Hadaller of Hanapin Marketing. Get ready for some excellent shopping and e-commerce tips! If ROI goals aren’t being met in your e-commerce account, consider segmenting your Shopping campaigns for a fast way to gain control over bids, budget and improve performance. While one campaign containing all products might be effective for smaller sites, using multiple Shopping campaigns is beneficial when targeting many products. 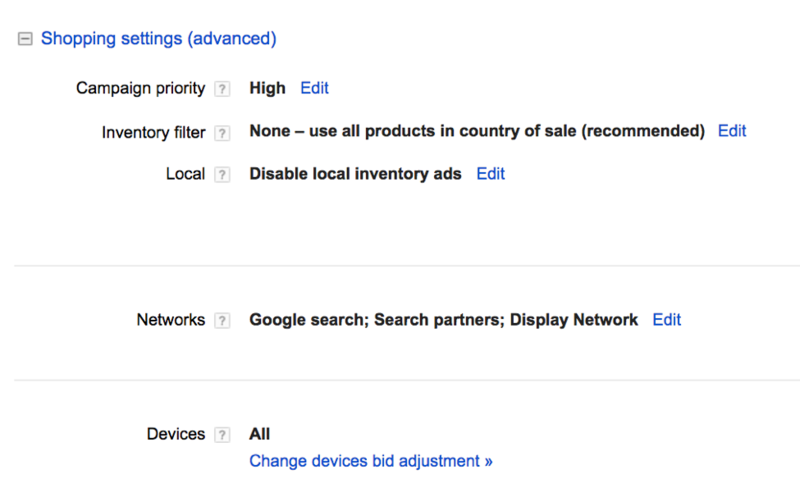 Let’s look at how segmenting Shopping campaigns helped increased ROAS for an actual AdWords account. This account ran for years with several Search and Display campaigns, but only a single Shopping campaign containing all products. After consistent Non-Branded ROAS decreases, we decided to segment the All Products campaign into the below segments. The below table shows performance for the date range before and after the Shopping campaigns were segmented. Overall conversion volume decreased by 30.93% due to seasonality during the holiday season. Despite the high volume of conversions and revenue during the holiday season, the 2:1 ROAS goal was not reached. After segmenting Shopping campaigns, ROAS increased by 33.95%. Once you decide your Shopping campaign(s) should be segmented, the next step is determining your new campaign structure. Below are five campaign segmentation ideas that apply to most e-commerce accounts. 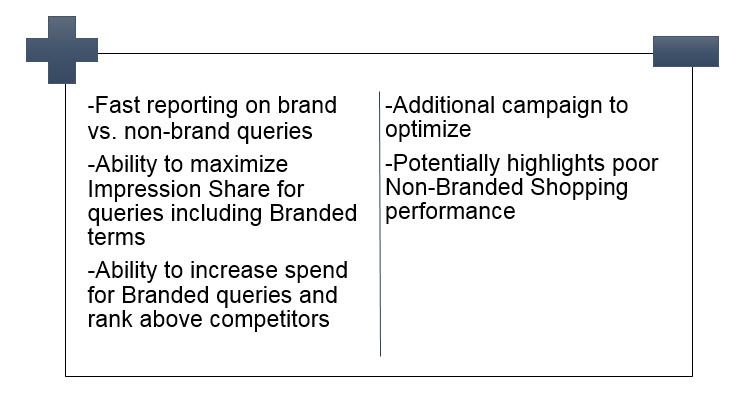 Splitting Shopping campaigns into Branded and Non-Branded queries has pros and cons. To split out Shopping campaigns into Branded and Non-Branded campaigns, add your brand name and variations of it as a negative phrase match keyword to the Non-Branded campaign. All queries containing the brand name will then be matched to products in the Branded campaign instead. Another great option for a separate Shopping campaign is a campaign containing products on sale. Use the high priority campaign setting to ensure queries matching to sale products are served ads from this campaign first. If your daily budget for this campaign is depleted at 6pm, ads can then still be served from the All Products Shopping campaign for the remainder of the day. Take your sale products campaign to the next level and implement Merchant Promotions to increase clickthrough rate! Another way to maximize Impression Share for top performing products is to break them out into their own campaign. This could include popular products that convert at a high rate or high margin products that have relatively low CPCs and result in high return. Set this campaign at a medium priority setting to ensure queries match to the sale products campaign first and the high ROAS campaign second. You might be wondering why you would include historically low performing products in your shopping campaigns. There are a couple reasons to consider giving low ROAS products a second or third chance. First, separating products into several Shopping campaigns gives you additional control over daily spend. Lowering bids and spend on an item will likely result in improved ROAS. Second, by separating low ROAS products into their own campaign, you’re also labeling these products as high priority for optimizations. This campaign should receive more Search Query Reports and bid adjustments throughout the month than the high ROAS campaign where products convert at a higher rate. Sure, you can go the easy route and increase bids for previous site visitors, shopping cart abandoners or loyal customers in your Shopping campaigns. Create a separate RLSA Shopping campaign using a high priority setting to maximize Impression Share for users most likely to make purchases. When setting up your RLSA Shopping campaign, make sure to use higher bids than the Non-RLSA Shopping campaigns. This ensures the campaign break-out will increase Impression Share and spend for your targeted audiences. Do you have any strong opinions on Shopping campaign segmentation? If so, feel free to comment!